Finally. A Dogfish Head beer has made it to my hands. 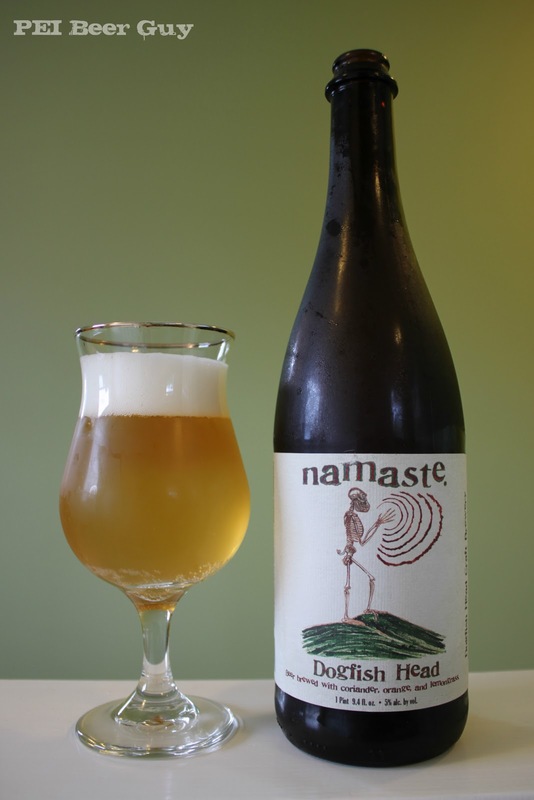 This one is Namaste, a witbier with coriander, dried orange slices and lemongrass. I was hoping, when I had it last night, that maybe its summeriness would help to eradicate the chilly fall-like day outside, complete with risk of frost. Namaste seems to pour with a bit of a haze at first, then goes completely clear (I don't think it was just chill haze... could be things settling out). It is a pale yellow wheat ale. It has a very white head that comes across as quite dense at first. It lowers after a bit of time, of course, and leaves just a thin white ring. Lacing is minimal. There's lots of yeast / sediment in the final pour. The aroma is solid. Not impressive, not disappointing. You get the yeast, coriander, and wheat more than anything else. Bright & Belgian. The taste is more of the same. At first, I was a bit underwhelmed. I had been eyeing this thing in my fridge for weeks, anticipating what it would be like. First sips were pretty standard - just a good witbier. Oh well. Then it does get a bit more interesting. There's a bit of bite from the orange peel, over top of the lemon, coriander, and base flavours of the beer. It's tangy enough that it almost comes across as sweet... like a mild (yet tart) powdery orange candy. Oddly, there's almost a hint of cream-of-corn flavour in the aftertaste at the beginning... it morphs to more of an orange one by the end when the sediment comes into play a bit. Overall, a decent flavour with a nice little / subdued orange twist. The feel of it is light, with a mostly dry finish. There is a lingering acidic tartness / twang to it on the sides of the tongue (and a bit up the middle) that also reminds of the aforementioned orange candies. The feel of the final glass (with sediment) was much smoother. Unlike my wife, who said "It smells like pee, and it doesn't taste much better," I thought it was decent (I'm thinking she's just not used to the style yet). Unfortunately, though, decent as it is, it's not overly memorable. I agree with your post. Namaste.......I expected you to blow my mind, but you were still solid. If you have the opportunity (through your buddy) to pick up more Dogfish definitely go with: World Wide Stout, Baton Burton, 90 Minute IPA, 120 Minute IPA, Festina Peche, and Punkin Ale.